Frank Stronach has sold nearly 17 million common shares in Magna since early December, leaving him with 1 million shares as of June 17. VANCOUVER -- Magna International Inc. founder Frank Stronach has been slowly but steadily reducing his stake in the auto parts company he founded, regulatory filings show. Stronach has sold nearly 17 million common shares in Magna since early December, leaving him with 1 million shares as of June 17, according to filings made to Canada's System for Electronic Disclosure of Insiders. 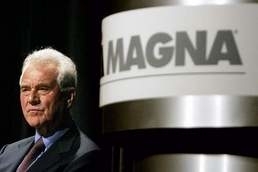 That leaves Stronach with a stake of about 0.4 percent in Magna, based on outstanding common shares of 242 million, according to Thomson Reuters data. After a slower start to the year, sales picked up steadily in May and June. Shares were sold at prices between $45 and $52.53 over the two months. Magna shares closed up $1.47 at $49.65 on the New York Stock Exchange on Tuesday. In Toronto, they finished 2 percent firmer at C$48.23. Stronach stepped down last month as chairman of the auto parts company that he started as a one-man tool and die shop in a Toronto garage in 1957. It now has 96,000 employees and expects revenues of about $27 billion this year. The company implemented a controversial plan last year to buy out Stronach for $1 billion in cash, common stock and other benefits in return for his controlling share block.